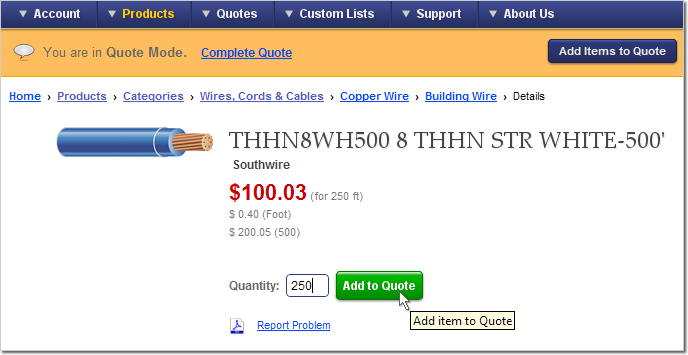 Offline quotation capabilities vary by location. The link to Create a Quote is found at the top-right of the main Quotations page (where it is found on most other Quotes pages). Clicking this button will begin the New Quote Creation process, and the website will go into 'Quote Mode.' You will be prompted for the basic quote information, then taken to a screen that offers several options for adding items to your quote (discussed below). 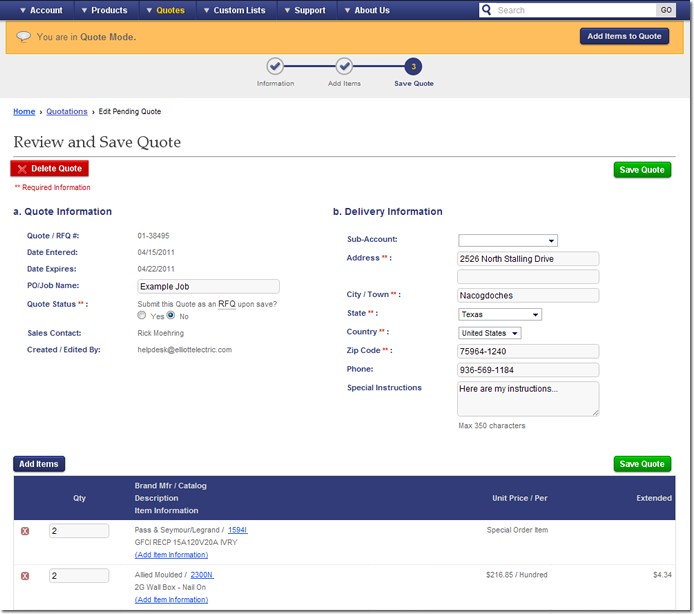 In addition to creating a new quote, from the main Quotes page you can click any quote number from the Recent Quotes list to view it in detail, with options to convert to order, create a copy for an end-user (your own customer), or export the quote via email, fax, or print. 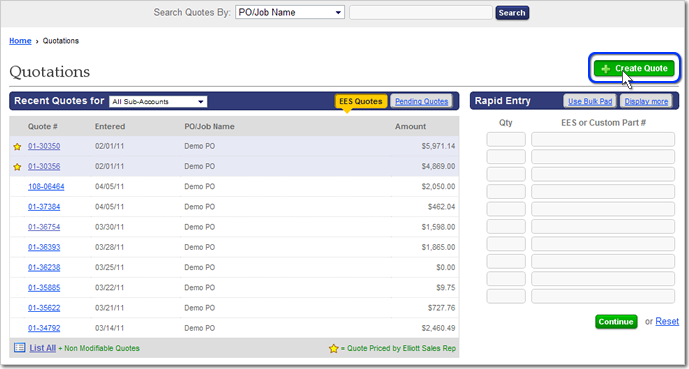 The Quote creation process begins by allowing you to enter your basic information. The process will proceed by offering you several ways to add items to your new quote (unless you initiated the Quote from another section of the website, like Products or Rapid Entry). You are now in 'Quote Mode,' as indicated by the orange bar that appears at the top of the screen. This indicator will remain until you complete (save or delete) your new quote (How do I complete a quote?). 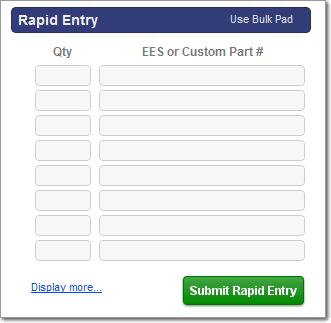 If you're creating a quote directly from a Rapid Entry box embedded on a main page, you can access the Bulk Pad for Quotes by clicking the "Use Bulk Pad" link at the top-right of the Rapid Entry box (shown above). 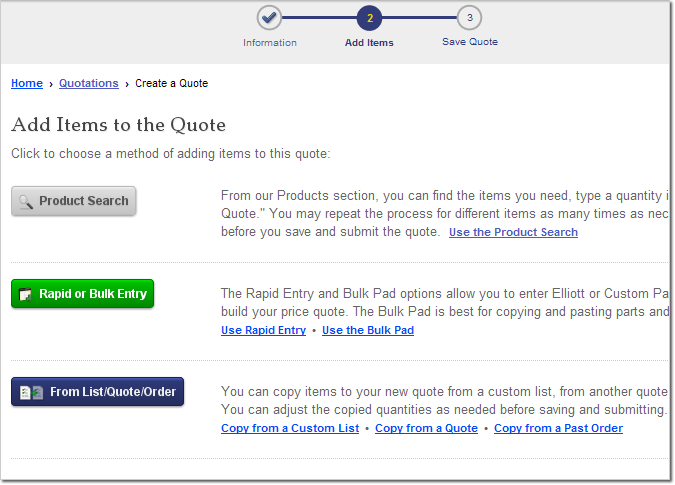 Otherwise, the default Quote creation process will take you directly to the Bulk Pad when you choose it. 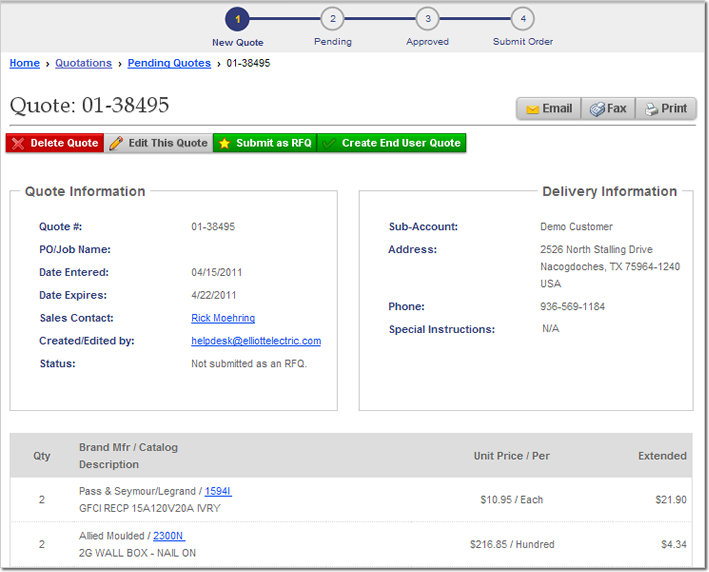 You may use Elliott part numbers, UPC Numbers, or any Custom Part Numbers that you've loaded into our system. 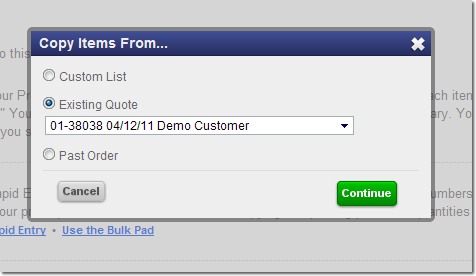 The bottom button on the 'Add Items' page, labeled 'From List/Quote/Order' lets you copy the items from an existing Custom List, Quote, or Past Order to your new quote. You'll be able to remove any items as you wish, as well as add other items, before you save the quote. Copy from Custom List – will take you to the Custom List main page. From here, open the desired custom list by clicking on it. You will see a table containing the list's items. 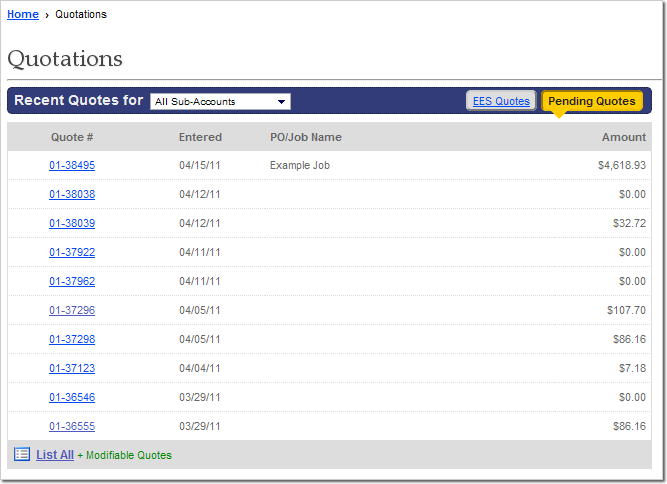 At the top-right of the table, use the "Add to Quote" button to add the selected items to the new Quote. You can pick and choose items, as well as add multiple copies of your selection. Once you're ready to finish adding items to your quote and save/submit it (or to save it for completion later, or to delete it), you can either click "Complete Quote" in the orange 'Quote Mode' bar, or click "My Quote" in orange (where 'My Cart' usually appears), both at the top of the screen. On the final page in the Quote Creation process (shown below), you can review your quote information, items, and quantities. If you want to discard everything, you may click the "Delete Quote" button. 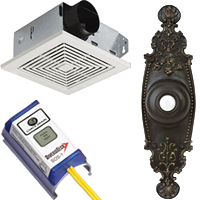 Choose whether you would like to submit your new quote as an RFQ (request for quote) or not. 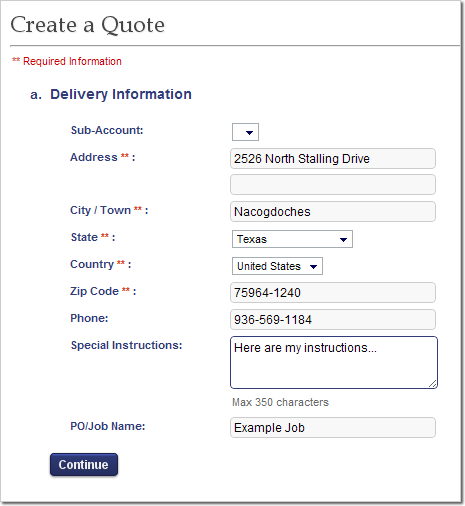 If you choose 'No' your quotes will remain saved as a 'pending' quote until you decide to submit it for special pricing. When everything is how you want it, click the "Save Quote" button.